The fox terrier is a delightful breed of dog. Fox terriers are energetic, playful and can be very loyal pets. The breed is generally prone to skin problems, however, and there are may be a variety of causes for the development of these skin conditions. While these issues can be addressed by qualified veterinarians, there are factors that are important for a veterinary caregiver to be aware of before they can prescribe the correct treatment, such as diet and grooming schedules for the dog. Veterinarians and owners of fox terriers have reported different skin problems that are commonly found in these dogs. These conditions include eczema, rashes, hot spots, and various bumps and edemas that can develop on the dog's skin, often without apparent causal factors. While some of these skin problems may in fact be benign and easily treatable, others can become ongoing irritants that can potentially present serious health risks for the dog, such as skin cancer. This is why a thorough understanding of the pet's environment and lifestyle are so crucial for diagnosis and treatment. According to Pet MD, the most common symptoms that have been reported include biting, scratching and self-grooming. While occasional instances of these actions will be common, the evidence of chronic attention to the skin in general or a particular area of the skin may indicate an allergy or infection from bug bites that need to be taken care of. Symptoms can occur in fox terrier puppies, as well, and these should also be taken seriously. Early detection and treatment are especially critical to the healthy maturity of puppies and advice from qualified veterinarians is recommended. 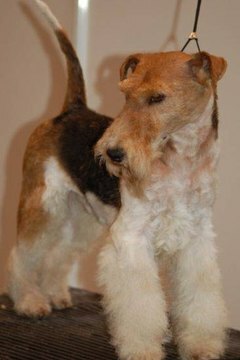 The range of causes of fox terrier skin problems is quite extensive. This is one of the contributing factors in the difficulty of properly diagnosing and treating a skin condition. Owners of this breed of dog have reported factors including food allergies, allergies to other animals, susceptibility to bug bites, and bathing the dog too often as possible causes of skin problems. The ASPCA also reports that a lack of grooming, especially during the summer months, which is essential in breeds such as terriers due to their wiry fur. This may prevent aeration and will lead to a drying out of the skin. The treatment for a particular skin problem will depend on the correct diagnosis of the cause. In cases where food allergies are deemed to be the most likely cause, specialized dog foods may be recommended. There are a variety of these types of special foods available, including foods that have been developed by veterinarians themselves. For cases in which reactions to bug bites are causing skin irritation, the treatment will involve bathing and treating the skin with medicated solutions. Some of these solutions can only be prescribed by a veterinarian, although most can be purchased over the counter. General skin irritation can be treated by using lotions and bath solutions that are specifically designed to alleviate conditions such as dryness and flaking of the skin. Bath soaps that contain oatmeal have been reported to have a good degree of success in treating these types of skin conditions. Yet the use of these bathing products is usually accompanied by a caveat of not bathing fox terriers more than every two weeks to prevent drying out of the skin. In some instances, a veterinarian may prescribe steroids, cortisone and allergen injections for more serious chronic cases. While these treatments can be successful in relieving the symptoms of skin irritation, it is generally recommended that the treatments continue for a short period of time, perhaps only a few weeks. There are long-range concerns about possible liver damage from extensive use of steroids and cortisone in particular.